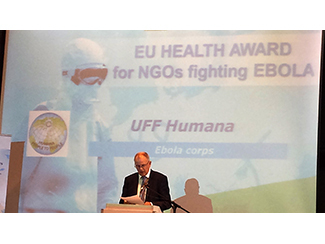 The EU Comissioner of Health, Vytenis Andriukaitis, presents the "EU Health Award for NGOs fighting EBOLA" on October 12th, 2015, in Luxembourg. As 24 other NGOs Humana People to people was nominated. The awards finally went to ALIMA, Concern Worldwide and Red Cross Spain. 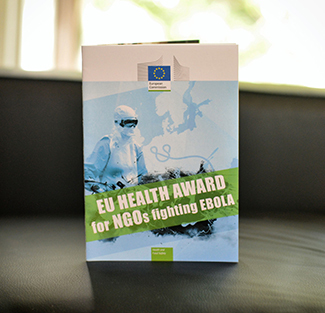 The European Union selected the three winning initiatives as models for the future, while recognising and commending the efforts of all who took part in the fight against Ebola. The initiative worked in key border areas with Guinea to build resilience and prepare communities should EVD cross the border into Guinea Bissau. The initiative educated and mobilised communities to preventthe spread of the disease and minimize the risk that the disease presents, should a case present itself. Over the course of the project, approximately 3,614 community leaders (traditional and religious leaders and teachers) and 1,197 local activists were educated and trained in EVD risk reduction. Awareness activities were carried out in 230 schools (approx. 26,000 children and teachers), and a total of approximately 44,500 families were provided with information on EVD. Furthermore, 400 community clean-up days were carried out by communities.